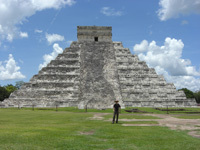 Last year, someone asked me for more details about our trip to Mexico in 2010. Since we planned our trip ourselves (no travel agency) and in the spirit of Scott Adams' "Next Big Thing" blog post, here are a few brief notes about the trip (initially sent to the aforementioned person by email). We mainly traveled by bus (for short-to-medium distances) and by taxi (in cities), except where indicated above (i.e. two domestic flights, one rented car, and ferries to/from Isla Cozumel and Isla Mujeres), which was really convenient. We chose to rent a car in Mérida, because Uxmal and the other archaeological sites in that area are really quite far away in the jungle and there are many places to visit (and walking between the different sites is not really an option). I guess you can also go with package tours and visit most places by bus, but you will probably miss the minor sites, as always. Of course, they're less spectacular, so it might not be a problem, but I really liked Sayil, Labna, etc. I spent a long time walking really alone in the jungle (my wife was a bit sick and stayed in the car). That was a unique experience! Buses: most of the bus companies have websites and you can even buy the tickets in advance and print them at home. Really convenient, but my credit card was blocked a couple of times (I bought the tickets from the US). The company we used the most is called ADO. Planes: we almost missed a domestic flight, because it was canceled. We were told that we had to wait 5-10 hours for the next flight, but we were finally able to take the next flight (extra seats available), just a couple of hours later. That was a stressful experience. I guess the lesson here is that you should call the airline companies or check online the day before just to be sure your flight hasn't been canceled. All the places we visited were fantastic. Really. Except maybe Villahermosa (which means "Beautiful Village", ironically). You can skip that one. Or at least, stay there as little as possible. What else? Spanish. I don't speak Spanish, but my wife does. English is often useless. Some people don't even understand a word of it. I had an awkward experience in a pharmacy in Puebla, without my wife. I think it was the first time in my life I really had to speak with my hands!